Saddamus Husseinus (Arabice plenius صدام حسين عبد المجيد التكريتي Saddām Ḥusayn ʿAbd al-Maǧīd al-Tikrītī) fuit quintus Iraci praeses, a 16 Iulii 1979 ad 9 Aprilis 2003. Saddamus die 5 Novembris 2006 ob scelera contra humanitatem commissa damnatus est ut suspendio perficiendus esset; unde Castris Iustitia, prope Bagdatum, hora 6:07 ante meridiem 30 Decembris 2006, morte suspensus est. Inter factionis Baath Arabici socialistici regentes, etiam postquam factio scissa est potens esse pergit et Iraciensem regionalem eius partem agit. Bathisticae ideologiae studiosus, quae nationalistarum et socialistarum sociationi favebat, die 17 Iulii 1968 subitanea rerum conversione maximi momenti partem egit. ↑ Saddam (IPA [sˁɑd'dæːm]) est cognomen, 'contumacem' vel 'qui se opponit' significans; Husayn est nomen patris et ʾAbd al-Majīd avi; locutio al-Tikrītī ad Tikrit urbem spectat, quam Saddamus puer habitabat. ↑ Saddamus damnatus, BBC World Service 2006/11/05BBC NEWS | World | Middle East | Saddam Hussein sentenced to death apud news.bbc.co.uk. ↑ "Supplicium Saddamo prope", dixit advocatus, CNN 2006/12/29Hussein-áexecuted with 'fear in his face' - CNN.com apud www.cnn.com. Al-Ani, Dr. Abdul-Haq. 2008. The Trial of Saddam Hussein. ISBN 978-0-932863-58-4. Clarity Press. Balaghi, Shiva. 2008. Saddam Hussein: A Biography. ISBN 978-0-313-33077-3. Greenwich Press. Baram, Amatzia. 2014. Saddam Husayn and Islam, 1968-2003: Ba'thi Iraq from Secularism to Faith. ISBN 978-1-4214-1582-6. Baltimorae: Woodrow Wilson Center Press / Johns Hopkins University Press. Coughlin, Con. 2005. 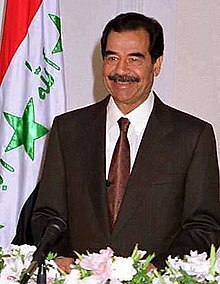 Saddam: His Rise and Fall. ISBN 978-0-06-050543-1. Harper Perennial. Gibson, Bryan R. 2015. Sold Out? US Foreign Policy, Iraq, the Kurds, and the Cold War. ISBN 978-1-137-48711-7. Londinii: Palgrave Macmillan. Karsh, Efraim, et Inari Rautsi. 2002. Saddam Hussein: A Political Biography. ISBN 978-0-8021-3978-8. Grove Press. MacKey, Sandra. 2003. The Reckoning: Iraq and the Legacy of Saddam Hussein. ISBN 978-0-393-32428-0. W. W. Norton & Company. Makiya, Kanan. 1998. Republic of Fear: The Politics of Modern Iraq. Ed. renovata. ISBN 978-0-520-21439-2. Berkeleiae: University of California Press. Murray, William. 2014. The Iran-Iraq War: A Military and Strategic History. ISBN 978-1-107-67392-2. Cantabrigiae: Cambridge University Press. Newton, Michael A., et Michael P. Scharf. 2008. Enemy of the State: The Trial and Execution of Saddam Hussein. ISBN 978-0-312-38556-9. St. Martin's Press. Sassoon, Joseph. 2011. Saddam Hussein's Ba'th Party: Inside an Authoritarian Regime. ISBN 978-0-521-14915-0. Cambridge University Press. Novissima mutatio die 5 Decembris 2018 hora 22:01 facta.